The road from Balranald to Hay traverses some very flat country called the Hay Plains. Irrigation channels carry water from the river to farms many kilometres away. As we left Balranald we saw a family of White Winged Choughs feeding on the roadside. Galahs in small flocks flew across the road as we travelled along and Australian Magpies were seen every fifty metres or so for the first part of this section. 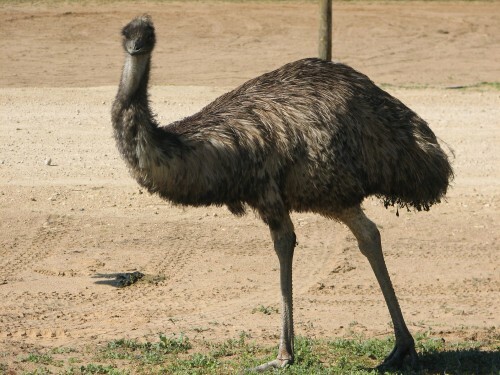 I soon added Emu to the list with three birds strutting along the fence line. I little further on we saw a lone adult male in charge of about six or seven half grown but still stripy-feathered young. A short distance on I came to a quick stop Ã¢â‚¬â€œ after checking for following traffic. Two magnificent Major Mitchell Cockatoos had flown in front of us and landed on the opposite side of the road Ã¢â‚¬â€œ and in full sunlight, their yellow and red crests glowing in the morning sun. Ã¢â‚¬Å“Get the camera!Ã¢â‚¬Â I demanded, but then disaster. A car coming from the other direction scared the two birds away. A lost opportunity. [sigh] The photo below of two Major Mitchell Cockatoos was taken by my son in the Taronga Park Zoo in Sydney. The rest of the journey to Hay was highlighted by numerous raptors (birds of prey). We saw quite a few Wedge-tail Eagles soaring overhead, several of them quite close to the ground. I saw a single Little Eagle sitting on the ground being harassed by an Australian Magpie. Black Kites also seemed abundant as were the Nankeen Kestrels and Black Shouldered Kites. We stopped briefly so that my wife could take some flower photos and while waiting for her I heard a Skylark, an introduced species from Europe. I was also amazed to see so many House Sparrows along this stretch; they were a long way from human habitation, their usual behaviour. At least two RichardÃ¢â‚¬â„¢s Pipits flew across the road in front of the car as we travelled along. You have searched the blog archives for 'hay plains'. If you are unable to find anything in these search results, you can try one of the category links below.